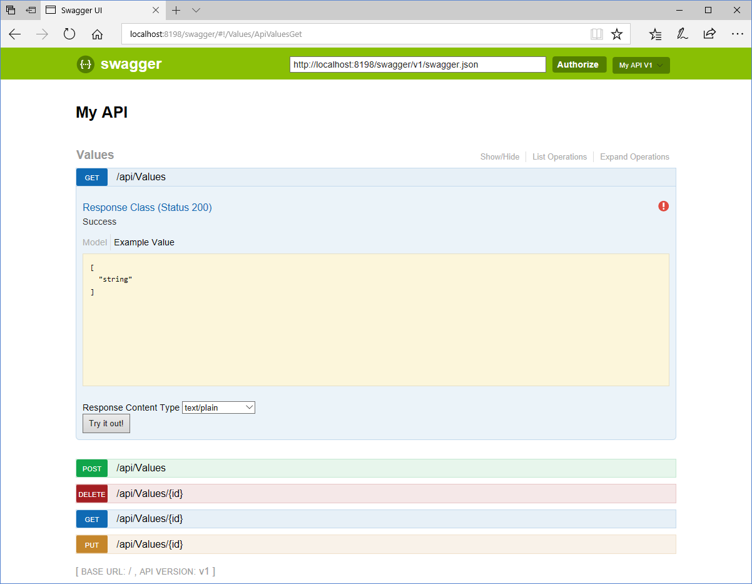 I’ve been trying to figure out how to enable authentication on Swagger UI setup on an ASP.NET Core API hosted on Service Fabric (currently hosted locally). I initially setup the Service Fabric project using the wizard and immediately connected it with an application in my Azure AD B2C tenant. 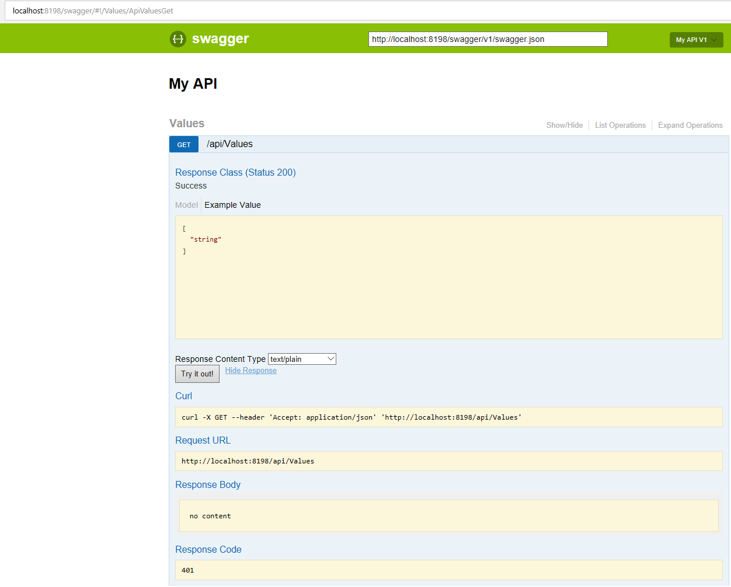 This appears to work but when using the ‘try it out’ functionality within Swagger UI, I get the HTTP 401 errors. I tried following the instructions here. This blog post provided a nice up-to-date walkthrough on how to setup the applications in Azure Active Directory B2C. Reply URL: While I do own that domain, I completely made up this Reply URL as there is nothing hosted at that URL. I haven’t even created the CNAME yet. App ID URI: I also made this up. Since I plan on only hosting one Web API that is accessible to my end users (on the B2C tenant) I kept it short and sweet ‘api’. 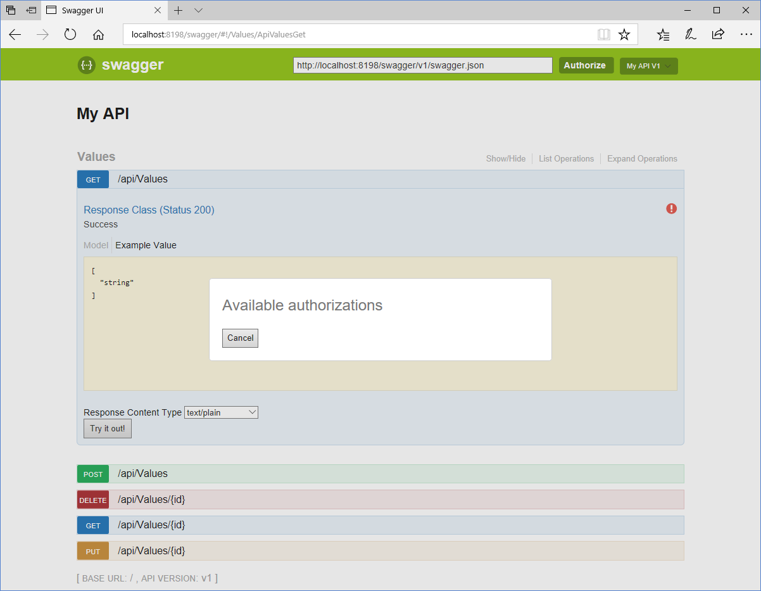 With my Azure Active Directory application configuration appearing to be per specification, I moved onto the last phase which was configuring Swagger UI to use OAuth2. However, it appears the above mentioned article seemed to be using standard ASP.NET instead of ASP.NET Core. As a result, I had to piece together the equivalent .NET Core commands using a few other sources. StackOverflow 1, StackOverflow 2, and GitHub. 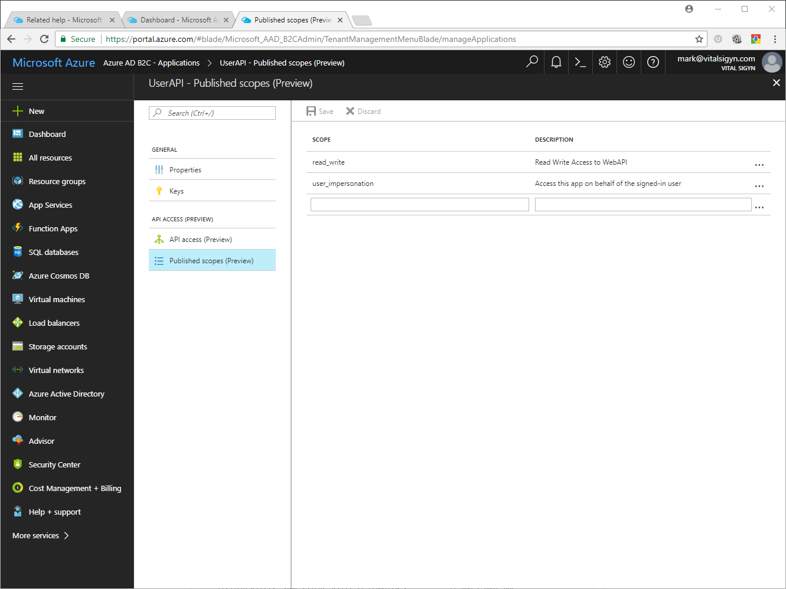 Scope URL: Changed to include my Azure Active Directory domain. I did a little algebra based on the URL specified in the article and how my Azure Active Directory Tenant / Web API application was configured. OAuth2 “clientid”: changed to be the “Application ID” of the UserAPI application. I’m not sure if this is the right thing to do or not as the article left it ambiguous where to obtain the value of the client ID from within the Azure portal or whether this value even matters. 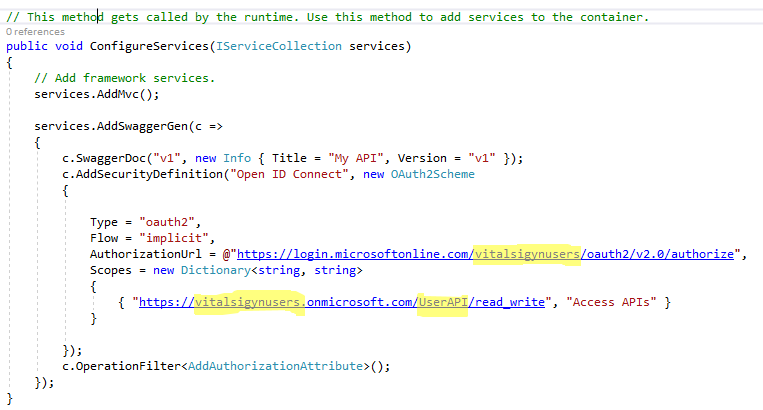 My assumption is that the Azure Active Directory’s Application ID is to be used as the OAuth2 “clientid”. Sign In Policy Identifier: changed based on what I named my “Sign In and Sign Up Policy” in the Azure Active Directory B2C Tenant configuration. After I do all that, I now see a red circle with an exclamation point in it on all of my operations. The fact that this list is empty is a clear indicator I did something wrong. I’ll have to look at it with fresh eyes.